This is easily one of the best homes in which we have ever stayed. The house is sparkling clean, comfortable, spacious, and has every amenity that you will possibly need. Mark and Susan are extremely helpful and responsive. The beds are very comfortable, the house is in a very quiet location, and the kitchen is very well-stocked. The pool table is in excellent condition and provided many hours of entertainment. There are lots of family board games to play as well. The outside area is incredible! Plenty of comfortable places to sit, a beautiful pool, and a Bali bed in a very serene, peaceful setting. The location is great, easy access to restaurants and groceries and lots of activities. We are looking forward to staying again. Mark and Susan's home is a remarkable haven, and it was the essential element for our memorable family trip. The photos, as appealing as they are, don't fully do justice to the beauty of the home and surroundings. Spectacular desert views, sunrises and sunsets, starfilled nights -- not to mention the lovely indoor spaces. Every comfort and amenity has been carefully thought out. Exceeded every expectation! We hope very much to be back for another vacation in the future. We stayed here with our extended family in mid December. Our group is very well traveled and everyone agreed that our stay was the best rental experience any of us had ever had. The home is beautifully designed, both inside and out. Mark and Susan have done everything to assure that guests have what they need for great fun and relaxation. Everything was generously well stocked and a beautiful basket of lovely goodies and a huge bowl of fresh fruit awaited us. Day trips were outvoted because people were enjoying the hot tub, pool and patios so much! The Bali bed was a big hit and provided unique outdoor lounging, while numerous patio seating spots and the outdoor gas fire provided lovely ambiance and encouraged folks to visit and enjoy the night sky. The beautiful outdoor setting with waterfalls at the pool, numerous fountains and the gorgeous view charmed us all. Our family loves to cook and both the well equipped indoor and outdoor kitchens exceeded our expectations. Communication with the host was clear, specific, helpful and very prompt. We had one of the best family vacations we have ever had and we truly appreciate hosts like Mark and Susan who put so much into what they do and who so generously shared their beautiful place with us. Thank you so much! We would not hesitate to return. This home is by far the best! We have stayed at many rental properties around the world, this home is by far the best! The outdoor living space is amazing. The new outdoor kitchen was perfect for preparing a entire meal while enjoying the amazing weather. It has a large grill (propane included), stovetop burners, portable cooler, cookware and utensils. My family loved swimming in the pool, relaxing in the hot tub and lounging in the private cabana. The entire home is impeccably decorated and includes high-end furniture, linens, cookware and technology. Susan and Mark thought of everything a family would need in a rental property. They installed entertainment systems in every room including Amazon Alexa devices. All devices in the home have easy to understand instructions. The check-in and check-out process were seamless. Mark followed-up with us after we arrived to make sure we had everything we needed. Mark even gave me a list of golf courses he enjoys. The home is a short drive to several great courses including Dove Mountain (I highly recommend this course). This property is an amazing find and the owners couldn’t have been more accommodating. I would recommend this property to anyone traveling to the Tucson area. Beautiful desert environment and perfectly appointed loving home. Perfect in every way. Thank you!!! Believe everything you read about this property and the owners are the best. It is the most amazing rental property we have ever stayed in and we have rented quite a few ! As a super bonus for us foodie types the kitchen was very, very well equipped and fun to cook in in every way. If you ever can bring yourself to leave the gorgeous compound grocery and fabulous hiking are only minutes away. This is the place for a special family get together with lots of communal and private spaces along with the peace and tranquility of the beautiful Sonoran desert, You can look and look but you won't find better than the Casa Campana. Mark and Susan, I have been tasked with composing a thank you note to you on behalf of the four of us who had the pleasure of staying in wonderful, beautiful Casa Campana. Let me begin by saying I think I know both of you without having met you. Your home is the embodiment of two people who have lovingly assembled a welcoming home for us to so thoroughly enjoy. The setting is quietly spectacular sitting nestled into a space you have made into a wonderful desert oasis of fun, relaxation and memories. I can’t think of anything that has not been thought of in this home...the beautiful pool, relaxing hot tub, the outdoor kitchen, fire pit and multiple conversation areas. Your gift for accenting the many peaceful seating areas is like nothing we have ever seen. Wow, Wow! We played many rounds of golf with friends at the Gallery and ladies manage to hike every trail at the Ritz. Yesterday they managed 12 miles in 4.5 hours! The men? We did nothing but prepare a wonderful steak dinner for friends, all the while enjoying the sunset and the sound of the waterfall gurgling into the placid water out of the pool. Unfortunately, the cooler nights prevented us from eating on the outside table, but no worries, Christmas lights kept us warm and peaceful inside. We enjoyed Game of Thrones and planning one last day in paradise! Thank you so much for sharing your beautiful home with us. We are already planning another trip to Tucson Valley to enjoy this experience again. Until this time next year, thank you from all four of us and have a wonderful Christmas holiday. Casa Campana is an amazing, beautiful home, that is extremely comfortable and stocked with absolutely everything one could want in a vacation home. Moreover, the owners are wonderful people, and truly care about their guests having an extraordinary time in their home. We couldn’t be happier with our experience at Casa Campana, and can’t wait to return for another vacation! A "first class" property. Our family of 8 stayed two weeks and loved the entire time (ages 3 to 70). PROS: Quiet & private location; beautiful landscaping front and back yards with night lighting inside and out (very relaxing); large swimming pool with option to heat (you only pay for LP gas used - a must have option if renting outside the hotter summer months if you want to swim); gas firepit (we used every night); hot tub; quality interior furnishings and nicely decorated throghout; short drive to Tucson restaurants and attractions; several flat screen TVs, Bose sound system, AirPlay, DVD player with lots of newer DVDs available; owners VERY easy to work with; lots of "little" touches that make this property a HOME you can rent - not just someone's rental property. CONS: After spending 14 days at Casa Campana - we don't have any. This IS a high quality rental. Amazing Property with Best Owner Experience! This property is "As Advertised". Beautiful setting and convenient access to shopping & activities. The house is extremely well-maintained and very functional. Could not have been more pleased with my interactions with the Owner and would love to return in the future! My husband and I have just booked our 4th straight year at Casa Campana, and I can honestly say it is my most favorite place to visit. First, the house itself is absolutely gorgeous and sits on ~3.5 acres at the end of a cul-de-sac, which means the surroundings are reliably quiet and serene. There are lovely covered patios both at the back and the front of the house with the mountains in the background, and each is very tastefully decorated in beautiful, comfortable furnishings. Beyond the covered area in the back is a magnificent pool, surrounded by lovely cacti and flowering plants that attract lots of butterflies—all immaculately maintained. Everything inside and outside the home is absolutely first quality, and there is not one thing I would not love to own myself. In addition to the comfortable surroundings, there are many unexpected surprises that enhance the environment and truly make it magical. There are gorgeous fountains all around, and at night there are colorful lights hanging from the tress all around the property, in addition to the professional lighting around the pool, fountains, and plantings—it is truly enchanting. We have rented many houses through Home Away and other sites, and often the photographs of the properties do not live up to expectations once you arrive. In the case of Case Campana, the actual home and property are even more beautiful than portrayed in the photos. We also find that the location in Marana is extremely convenient—we love that the whole area is very uncongested, but it has a wonderful supermarket very close-by in addition to the amenities at the Ritz Carlton at Dove Mountain. It is also quick and easy to get into downtown Tucson or to Highway 10. Finally, I would like to say a word about the owners, Mark and Susan. Each guest receives an extremely generous “goody bag,” which has included tasty treats and snacks, a very nice bottle of wine, monogramed hot/cold cups, the bag itself, and various other goodies. Mark is extremely helpful in explaining the impressive electronics and how everything works. And, he is always available via email or text during your stay if you have any questions at all. Mark and Susan could not be more generous and accommodating hosts, who will do everything possible to ensure you enjoy your stay. It is truly rare to find a home with such quality items throughout that is available to rent—I could not recommend this property more highly. We have rented dozens of VRBOs and AirBnbs over the years and this place was far and away the nicest, best cared for, most completely appointed home we have ever seen. It is every bit as lovely as the pictures, and the sunsets are amazing. The kitchen was fantastic, with very high-end appliances, knives, and table settings. The beds were fantastic, the linens were brand new, the pool toys were new, the outside sitting areas had new furniture....everything was amazing. Thanks so much! Beautiful home with gorgeous landscaping and comfortable surroundings. Many wonderful amenities provided. The home owners were so wonderful to work with, and really cared about your experience. Felt like we were at a resort! Definitely want to go back one day. Alexa: how do you find the perfect place to stay with friends and family for a group vacation? Stay at Casa Campana! Mark ( the owner) was great and he was easy to reach and communicate with. Incredible time this year. The house was perfect for our group! This is our second stay at CC. Luv the Alexa addition, the sound system in and out, and so many areas to relax and enjoy the Tucson weather. Thank you Mark. The kitchen and great room layout are perfect for us. Well thought out. We prepared dinner each night together as a group, laughing and cooking. The new outdoor grilling station was perfect. The house is extremely clean and stocked for all of your needs- from the kitchen to the pool area to the bathroom and shower area with outdoor pool access to the patio bed for a nap. The owner really pays attention to the details. Incredible afternoon and evenings poolside. Night time gathering around the firepit. Hot tub to relax and re-charge for more golf and exploring Tucson. I would recommend Casa Campagna to anyone needing an Oasis to get away to. Coffee on the front patio in the morning, then the landscaped and beautiful seating areas and pool areas in the back. Dinner table inside looking out if too hot, dinner outside on the patio under cover, even sun screens if needed. So many seating areas to talk and laugh and enjoy the group. We spent time sitting on the ledges in the pool and the umbrella near the shallow shelf as well. We can't wait to come back again. Thanks again for the second year of unforgettable memories of our visit to Tucson. Alexa, tell Mark we will be back! The week we spent at Casa Campana was delightful. The home is large but not overwhelming, very well appointed, totally clean, and on a lovely piece of land with neighbors far in the distance. If you stay here, you won't want to leave other than to take a trip to the store for provisions. We cooked every day in a luxury kitchen, spent evenings watching the monsoon storms from the shelter of the outdoor patio and swam hours each day. Enjoy this place - it is very special. This is the nicest place we've ever stayed in. Mark and Susan exceeded our every expectation. We will return and highly recommend the experience! We began visiting Tucson 4 years ago when our son started the University of Arizona. For his graduation we needed a place that could accommodate our entire family with multiple generations that were coming in from all over for the ceremony. What a wonderful find Casa Campana was. The property is gorgeous inside and out. The back yard is better then a 5 star resort and the house itself was the perfect place to relax and celebrate with our family. Mark and Susan truly have the gift of hospitality. From the moment we entered their home to find a gift tote stocked to get our vacation started and a Happy Mother's Day bouquet we knew we had found a special place. The kitchen is stocked better then my own home, and there is a huge grocery store just a few minutes away. We have never stayed at a house that was as nice or set up as well for guests. If you are looking for the perfect place to stay in the Tucson area this is the property. We will be returning. Thank your Mark and Susan for a magical vacation. There are not enough words to describe this fantastic home. When we arrived we were overwhelmed with the beauty and the detail to every room and the backyard oasis is incredible. The owners Mark and Susan had a special tote bag filled with so many fantastic Arizona keepsakes, wine, glasses variety of goodies and home made cookies plus a birthday present. If you are looking for the home of your dreams don't pass this one up it has everything you can dream of. The serenity of the location and so many areas to relax are incredible. You won't believe the trees on the property at night.. Outstanding! Attention to detail made our stay a "no-brainer"
We stayed 5 nights with extended family visiting our U of A daughter. We choose the house bc it could host all plus have room for any of our daughter's friends for the Easter holiday weekend. Every detail was beautifully thought out starting with the welcome basket with "treats" for all to instructions for everything from restaurants to appliances! The house was beautifully decorated and supplied with games (board games as well as pool and ping pong) and movies hitting all tastes. Where we spent all of our time though was in the yard, by the pool, hot tub or taking shade in any number of seating areas. The landscaping was stunning and at night the solar lanterns in the surrounding trees were spectacular! Thanks Mark and Susan for a lovely couple of days! Our stay at Casa Campana was a truly wonderful experience. Susan Mark have thought of everything. The house is immaculate and well stocked. The pool area is extremely inviting and a great place to relax. Casa Campana is the best vacation rental we have ever had. Couldn't ask for a nicer place to stay and nicer people deal with. The house was well set up, clean, and prepared perfectly for us. The pool and hot tub were just as pictured and clean. Mark was great to deal with and easy to get a hold of. I would recommend this house to anyone looking for some fun Tucson. You will not be disappointed. We are not surprised to find that others share the same feelings about Casa Campana as we do. It is the most beautiful home we have rented and is just as these other reviewers describe. Better than the photos, immaculate property, awesome kitchen, amazing landscaping, pool & spa, with many restful areas to appreciate the distant mountains & surrounding natural desert beauty and hummingbirds, doves, butterflies & fountains from sunrise to sunset. And then the twinkling lights come on in the trees, under a perfect sky of stars. We are so very grateful to our kind and thoughtful hosts - Susan & Mark - for creating this paradise for us to visit and are already looking forward to our return next year. Immaculate, luxurious Private desert villa! Triple A+++, would give this rental 1000 stars if possible! Usually, after two weeks of vacation , I'm ready to go home. This time, was seriously considering staying longer! The pictures do this place no justice, it's spectacular! The level of care, thoughtfulness, and attention to detail is unparallelled in any other property I've ever stay at. The outdoor area is hevenly, with loads of cozy seating, beautiful plants , and an amazing pool. We paid for the gas to heat up the pool, and we spent many happy hours playing in there! The hot tub, and over sized fire pit made the perfect location to watch the stars come out. The house itself has everything you could need! We really enjoyed all the board games, and even completed a 1000 piece puzzle! The beds are comfortable, rooms spacious, and everything decorated so beautifully. You can see a lot of care went into making it a special home. We love this rental so much, we've already booked it again for next year. It's private setting, in the lovely Marana area made it the perfect base to explore all the Tucson area has to offer. But truly.. It's the fact that sweetest people ever own this home that make it truly special : Mark and Susan were helpful, and attentive, even taking time out of their own vacation to make sure things were going smoothly for ours. From lovely welcome baskets, to helpful guides, to a smooth check out, they are amazing to work with. Book this property today- before someone snaps up your dates (like me, haha). We enjoyed our stay at this property more than any other VRBO we have stayed at in the past seven years since beginning our stays with them. The attention to detail was wonderful, from the welcome basket when we arrived to the ten separate outside sitting areas. The landscape was perfect and the pool and surroundings blended well with the landscape. The house itself was beautiful. Four bedrooms, each having their own TV and very spacious. The master was luxurious and well maintained. Often when you go to homes, the pictures that you base your choices on are frequently not really what you get, but with this property, it is even better than the pictures could portray. Mark was also attentive and gave us ideas for hikes and checked in to see if we needed anything additional. He was a joy. We would recommend this property to anyone, and would stay there if we ever return to Tucson. We have rented many, many vacation homes over the years, and this property is without a doubt the most well equipped home we've ever stayed in. It is obvious that Mark and Susan have given careful thought and consideration to the needs of their renters. Their communication with us during our stay was greatly appreciated. Instructions were so clear, we literally had no questions! The home is truly lovely, the outdoor space is beautiful, and we loved our time there. Mark was extremely accommodating from booking through checkout. The hosts obviously put a lot of thought into both the comfort and aesthetic details. My wife and I rent many vacation properties and Casa Campana is among the best we've experienced. Our favorite features included the yards and landscaping and the other outdoor features including the spa. The sound system and televisions are very impressive, and the guest guide explains all the details in a very user friendly format. Finally, the fact that the home is right next to the expansive Dove Mountain resort means that you have many resort amenities close by without having to pay for them! We especially enjoyed the hiking trails you can access from the resort property and relax afterwards at one of several resort restaurant/pubs without having to be a member. We had planned to spend more time in Tucson, but this property was just too special to leave. Thanks Mark and Susan for creating this space for us! 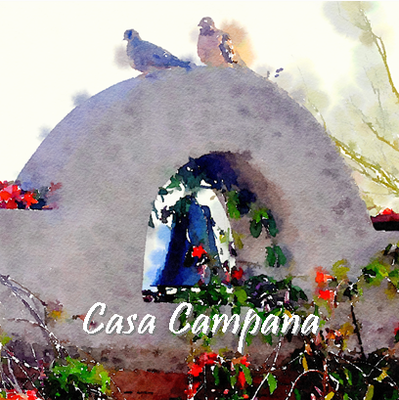 Casa Campana is your Tucson dream vacation home. The home is perfect for large families or groups. When we walked into the home it far exceeded any expectations we had. The inside of the house was perfect. The kitchen has everything you need and was right next to the TV room with a great sectional couch that so comfortable. the pool table is an added bonus! The pool and patio area was great to enjoy the warm Arizona weather. We loved gathering around the fire pit at night. I would highly recommend this home for anyone!! We will be back! Look no further for the perfect house for your group in Tucson: Casa Campana has it all. The house is spacious, warm and fully equipped with everything you need and then some. The pool area is beautiful and relaxing, you will never want to leave. Mark and Susan were wonderful to work with throughout the entire process. Our entire group enjoyed every minute of this wonderful home. I would highly reccommed Casa Campana for your next vacation! My wife and I spent 10 days at this wonderful home in September. The property is even better than the online pictures portray. On arrival, we were greeted by a welcome bag packed with Arizona goodies! The inside is lovely with a fantastic great room with large TV, beautiful kitchen with all appliances and there is even a pool table! Mark and Susan were very helpful both prior to our travels and during our stay - they were happy to answer any questions regarding the property and local recommendations. The home was clean, well-maintained and the outside areas were wonderful to pass the day, watching and listening to wildlife...hummingbirds were a particular favourite! The pool is fantastic and many hours were spent swimming and relaxing in our beautiful, private surroundings. The stars were incredible to see at night-time! The house is located in a desert setting but you are also close to amenities including the Ritz-Carlton at Dove Mountain which is a lovely place for an evening drink! We would highly recommend this home - we created some fantastic memories and were lucky to be able to catch up with our American side of the family who we invited over one evening to share our experience at this villa. Big thanks to Mark and Susan - everything was thought of and we can't wait to return to Arizona! Casa Campana proved to be a wonderful place to spend our vacation. It was perfectly situated for a relaxing and peaceful holiday with everything you could want at hand. Early mornings were our favourite as we sat drinking our coffee watching the sun rise. We will always have special memories of our time spent here with our family, Every need was catered for and every part of the day was perfect, there were so many places to sit and relax. We enjoyed visiting the interesting Titan Missile Centre, the fun at Tombstone and our dinners at the Carlton Ritz Hotel Restaurant at Dove Mountain. The property was exceptionally clean and well maintained and a pleasure to take care of. Meeting Susan and Mark, the owners, was especially good and they could not have been more kind and helpful. Anyone spending their vacation at Casa Campana would be very fortunate and we are delighted to recommend this property. We were so impressed with Casa Campana last year, we had to come for a second visit. It is the perfect place to relax, reconnect with family and nature, and explore the great state of Arizona. The house is very roomy and well equipped and the decor is beautiful. The pool and patio area draws you outdoors to the beautiful landscaping and comfortable conversation areas. An afternoon nap on the Bali bed is pure bliss! I love that you can walk out the door and into the desert, which is so fascinating. We saw quail, jackrabbits, roadrunners, coyotes, and, of course, the nighthawks. My father was fortunate to see a bobcat, which totally made his holiday! We also enjoyed an amazing evening on the pool deck viewing the moon, stars and planets with Ben Loker of Arizona StarTours – definitely a highlight of our stay. We love the location, north Tucson but close to everything, including I-10. The nearby outlet mall is fantastic for those of us who like to shop. Some of the other places visited were Tombstone, Pima Air & Space Museum, and the Arizona Sonora Desert Museum. For some of us, though, it was hard to tear ourselves away from the tranquility of Casa Campana. The Welcome gift bag was/is delightful along with the loaded fruit bowl (everything we needed for guacamole and fruit salad)! Also much appreciated were the tourist brochures and maps, and the books, movies, and music. We felt so spoiled and everyone in our party was thrilled to be in such a wonderful setting. Thank you, Mark and Susan for sharing your home and for your exceptional care and hospitality! This was our second visit and the property was as immaculate as before. In addition, the owners spared no efforts to make our stay as enjoyable as possible. Highly recommended. We were so ready to get away from our Michigan winter and this was our first visit to Arizona. What a treat to stay in your fabulous desert oasis! The location is so peaceful and beautiful with the natural desert scape surrounding your home. The views of the mountains can be seen from nearly every spot in and around your home. So many choices in sitting/lounging areas around your home allow for quiet time and enjoyable eye catching views! Loved the front courtyard with the relaxing fountain and the back area with fabulous pool, hot tub, fire pit and bali bed!! Also loved all of the lanterns in the trees at night. Your home is spotless and absolutely gorgeous with the rustic southwestern decor. So many fun details to make it feel extra comfortable and special. Absolutely everything we needed, and more, was provided. So very kind of you to leave us with a gift bag filled with goodies...yummy foods and wine!! We had 2 teenage boys that loved the pool table and choice of movies. They hiked everyday and came home with interesting desert finds such as a deer antler and at night we had a special flashlight that allowed them to search for the glow of scorpions! The excursion highlight of our week was Arizona Adventures ATV's thru Box Canyon. About an hours drive from the house but well worth it! Spent that afternoon exploring the canyon on ATV's with tour guides...an absolute blast for both the teens and adults! We would absolutely recommend your property to anyone! We've rented many homes in different states but this, by far, was the best! Thank you again....we look forward to coming back at Christmas!! We are a family of four with two teenage boys. My mother had come along and my in-laws live in Tucson and visited regularly. We had the best time! The house is spotless and has room for everyone to enjoy. The backyard is a place you can stay all-day with the various places to relax. The swimming pool and jacuzzi are awesome and we enjoyed these daily. I would highly recommend this property! This house is as advertised. It is very clean and well maintained. The kitchen had everything that we needed. The backyard with the pool and outside patio is a great place to reflect on your day's activities. There were 7 adults staying at the house for the week and there was plenty of space for all of us. We could not have asked for anything more from the property. Mark and Susan are the perfects hosts. Mark checked in to be sure that things were going OK. Thanks for a great stay. This is a gorgeous home, spacious, beautifully furnished and architecturally stunning. The house is well designed to allow great views of the desert from inside, and outside. The outside spaces are so perfectly developed, it draws you out to either the front or the backyard with pool, lounge, covered patio. The hosts were gracious, accommodating, and helpful in every way. I recommend this property as a wonderful place to stay while visiting Tucson. Dr. James I. What a wonderful week we had at this home. The house is well appointed. They have thought of everything. It is a quiet setting and our group had a great time. The home owner is very attentive and checked in throughout the week. We had a multi-generation group from age 28 to 85, and everyone enjoyed themselves. It is a beautiful place to watch those great Tucson sunsets and the patio is a great place to relax in the evening. Oh those lanterns in the trees! So lovely. If you are looking for a home where all your needs have been thought of, this is the place to go. Mark and Susan, we will be back. And thank you for all those little touches that make this the BEST vacation rental ever! Such an experience of a lifetime. Mark & Susan have thought of everything. A piece of heaven from which we never wanted to leave. Very serene & peaceful from sunrise to sunset. We eager to return! Spectacular home. Stocked with absolutely everything you would need from a variety of dishes, excellent cookware, furnishings - more than all the comforts of home. We stay in many VRBO's and have never enjoyed one that had as much thoughtfulness put into the preparation of the home for renting. Additionally, Mark & Susan are wonderful people and were genuinely concerned that our time there was enjoyable! Rent this home in Marana!! Do not hesitate to rent this spectacular property! We have 20 years (15 in Tucson) of vacation rental experience and this is our favorite Arizona home. The open floor plan of the living space is very comfortable and welcoming. The outdoor living areas are amazing, both the front courtyard and the expansive back patio/pool are unsurpassed - the photos, although great quality, cannot capture the real beauty and charm. The home is generously appointed (we especially enjoyed the game cabinet), and meal prep did not leave us wanting for any gadgets. We dined most evenings on the patio and enjoyed the gas fire pit afterwards as the starry expanse appeared overhead along with the night hawks catching their evening meal. This backyard sanctuary was topped off by views of the city lights and serenity of the quiet, still desert. The owners are extremely responsive, helpful, and yet not obtrusive. We wholeheartedly endorse this true resort oasis. Casa de Campana is a stunning home set in a pristine desert environment. The indoor living areas are spacious and comfortable. With 8 adults during our stay, we never lacked for "personal space". The kitchen accommodates 3 or more for cooking, and the open living design allows everyone to gather during meal preparation. The kitchen is also well-stocked with any tools a cook might need. The owners did not hover but were available by text or phone if we needed anything. Our last minute request to heat the pool was conveyed and accomplished with ease. This home was immaculate and well stocked with all essentials. Indoor recreation included pool and ping pong tables, satellite tv, and a generous assortment of reading materials, board games and the most comfortable couch that held all 8 of us for an evening of games. The outdoor living space is really something to behold. At least 5 different lounging alcoves including dining area, comfy couches and seating areas and my personal favorite the bali bed. Mornings and evenings are magical, with birds and coyotes providing the soundtrack. The swimming pool, jacuzzi tub and fire pit were a hit with all of our party. Beautiful landscaping fills out the scene, all showcasing the best of desert botanicals. Casa Campana truly is the ultimate vacation rental. Mark and Susan have captured the essence of vacation hospitality. Their beautiful property showcases all things Arizona. I can't wait to return. Grab this house if you can! It is beautiful and comfortable with wonderful views of the desert and mountains. A large patio area with flowers, cactus, a pool, hot tub, fire pit and many comfortable seating areas. You can eat outside at the large dining table and when it gets dark you can sit and watch the lesser nighthawks swooping overhead as they catch insects to eat. A great kitchen and living room and large comfortable bedrooms with large bathrooms make this house a pleasure to be in. All are super clean. Near some restaurants and not too far from downtown Tucson. I loved it here and wished I didn't have to leave. You will be very happy here as we all were. The owners are friendly and available if you need anything. To me this house is perfection! Lucky you!!! Having traveled lots and used VRBO many times, we could not have been more pleased with this gorgeous property. What a perfect desert vacation for our family! My husband and I traveled to Tucson from Colorado with our two young children, and my parents and my husband's mother also joined us. After a week at this lovely home, we all wished we could have stayed for longer! If you have young children, this is absolutely the perfect rental home for you... Everything you could possibly need is already there for you: sippy-cups, plastic kid plates/bowls/silverware, highchair, Pack n' Play, kid-size life jackets, pool noodles/rafts, games and puzzles, jogging stroller, and a play yard (perfect for use on the shaded patio). The pool has a shallow end that is perfect for little ones, including a built-in umbrella that nicely shades part of the shallow side... ideal for kids who sunburn easily but still want to be in the pool. The large house easily accommodated our party. The four bedrooms were perfect for our group. The large master suite felt luxurious, and we enjoyed the easy access to the huge back patio... perfect for drinking a quiet cup of coffee outside before the rest of the group stirred. We found the Tahoe bedroom and the Route 66 bedroom ideal for our family of four, with easy access to our little ones through the jack-and-jill bathroom. The queen bedroom does not have an ensuite bathroom, but there's easy access to a full bath just across the hall. The open kitchen/dining area/living room made it easy to socialize and keep everyone together, even while cooking meals. Not only was there plenty of room for the entire group, the house was incredibly well equipped and wonderfully clean. We really enjoy cooking together, and every time we prepared a meal, everything we could have possibly needed was in the well-stocked kitchen and ready for our use. The whole group loved the pool and hot tub, and the patio is perfect for lounging and dining al fresco. We so enjoyed sitting outside in the evenings around the fire pit and watching the nighthawks dip and dive around the pool and patio area. What a perfect spot to drink a glass of wine, enjoy the sunset, and revel in the desert splendor. We so enjoyed meeting Mark and Susan and found them to be lovely, gracious, and helpful hosts. The great welcome bag, fruit basket, and pillow pets for our kids were very appreciated. All in all, highly recommended. We'll definitely return! This was the perfect place for our family to meet and enjoy a week together. We did some touring and eating out but the best times were at the house swimming, playing games, and just being together. Such a well planned and well equipped home! This is truly an amazing property! We loved every minute of our vacation here. The owners were so friendly and helpful. They have stocked this house with everything a family with little ones could ask for. We literally spent every night swimming and relaxing in the backyard. Simply wonderful. Would highly recommend! We will definitely be back. The property is stunning, with mountain views all around. The pictures don't do it justice, as it's even more beautiful in person. Upon arrival, the owners had went above and beyond to make our family feel welcome. The house was spotless, and we didn't have to do a thing...we just unpacked and were ready to go! The house is far enough out of the city to get some nice quiet time, yet close enough to enjoy the amenities like a local grocery store, and Starbucks. Mt. Lemmon is a short drive, and we ended up going up there two days in a row because we loved it so much the first time! There is a state park about 10 minute's drive from the house with the best "golden hour" on the mountains of anywhere I have ever seen. If you like sunsets, there is a wonderful, gentle hike that allows for breathtaking views at sunset. I have already referred two people since we've been back home (2 days!). I would recommend this rental to anyone who is looking to relax, yet have hiking trails and mountain climbing a short drive away. The pool is wonderful, and it is an amazing thing to be floating in the pool at night, looking up at the night sky, and see the twinkling lights of Tucson below. Best rental we have ever had, and we have traveled all around the world. Thank you so much for opening up your beautiful home! We will definitely be back. THE OWNERS GREETED US WITH SOFT MUSIC, A LOVING ATMOSPHERE OF SPARKLING CLEAN EVERYTHING....AND A HARMONIOUSLY QUIET AND SERENE WALLED DESERT RETREAT...of sparkling pool, hot tub, and after dark, a gas fire ring to sit around like a campfire...to sip a glass of wine. We visited during monsoon season....and it rained...but, we hiked Tohono Chul...and the Desert Sonora Museum...anyway...both great learning experiences. This was our second visit here...this time, the baby learning to walk loved it, we retired elders loved it as did the mom and dad still working. With over 60 movies from which to choose and a terrific pool table..(we all laughed a lot there too! )..we were never bored. Bird lovers, desert lovers, hikers ( scenic Mt. Lemmon invites, maybe next time!) and the charm of this remarkably appointed home gives one memories for a lifetime. Thank you Mark and Susan for your kindness to us and all your guests. And the heavens for their starry, starry nights and truly awesome sunsets. This property is beautiful. The home, the landscape, the scenery... Just amazing. We had eight people in our party and we were all very comfortable during our entire seven night stay. The owners thought of just about every small detail you could want, when on vacation. Mark was quick to answer any questions we had and even provided us with a welcome gift bag upon arrival with lots of local goodies. Watching the frequent thunderstorms around us in the night sky while having dinner in the beautiful outdoor patio was an experience we will not soon forget. We will definitely be back if the opportunity to return to Tucson presents itself! Casa Campana is lovely! Located close to everything yet tucked away in a serene desert setting, the Casa was a perfect reunion retreat for my five friends and me. There is not an item or detail overlooked -- leading each of us to wish we could transport at least the kitchen to our own homes! We enjoyed the terrace and pool daily, specifically at night when the the lantern lighting turned the beautifully landscaped surroundings into a fairyland. The owners were more than wonderful -- answering every question, responding immediately and always attentive to every detail. There was even a lovely welcome gift bag waiting for us when we arrived. We are hoping some day to return to Casa de Campana whether together or with our own families -- it is definitely a home to return to! Casa Campana is a beautiful house - close to local amenities, yet in a true desert location. Being weary travellers from the UK arriving at the house (in a storm) having been awake 22 hours, it was great to find that Mark and Susan had thoughtfully provided coffee for us and also left a gift bag. This is just one example of their attention to detail and commitment to making sure their guests are comfortable - we have rented a number of properties in the US and Casa Campana is without a doubt the best of them. It's all too easy to laze by the pool watching the birds and the butterflies, but there's a lot to do in south eastern Arizona and another advantage of the house is that it's so easy to get places from there. In summary, we enjoyed our time at Casa Campana immensely and would definitely recommend it to anyone planning a stay in the Tucson area. It is hard to find the words to express the perfection of Casa Campana. First, we can say it is just as beautiful as the pictures, if not more so. The house itself is extremely well appointed with very nice furnishings and high-quality kitchen/cooking items. Everything one could possibly need is there and neatly organized and labeled. The house was scrupulously clean and the grounds meticulously manicured. It is quite obvious that the owners take great pride in this home and care very much about maintaining everything in pristine condition. The outdoor spaces, both in front and in back, are very inviting with comfortable seating arrangements and gorgeous flowers and plantings. The area in back even has solar shades that can be lowered to protect the seating area from the intense sun when it is low in the sky in the afternoons. There is always a comfortable place to hang out and read or socialize during the day or at night. The location also turned out to be quite convenient, as there is a large supermarket very nearby, as well as some restaurants. It's also an easy drive into town to sample the vast array of possibilities there. While we normally enjoy eating out, we found our surroundings so peaceful and pleasant we rarely left the property. At night the outdoor space is somehow even more appealing with gorgeous lighting and mesmerizing solar lights in the trees that actually change colors! Most nights we simply stayed home to enjoy the atmosphere-and of course the hot tub and the fire pit-as well as the night sounds from the animals. We have rented many homes over the years through HomeAway and other sites, but we can honestly say Casa Campana was the absolute best - we are already making plans to return next year. Everything was perfect at the Casa. We loved the location. Privacy but close to all the things you need. We rent high-end homes all over the world. It has become our preferred way to travel. I always end up buying things that I invariably leave behind. This was the best equipped home we have ever been in. Cooking was a delight. We had a couple of rainy days and the comfy living room with big screen TV for movie watching was a big treat. Mark and Susan were wonderful hosts. It was clear that making our stay at the Casa was a top priority. Thanks to both of them for opening up their beautiful home to us. Casa Campana is the Ritz Carlton of vacation homes. From the time you enter till the time you leave you will enjoy all the fine amenities that Mark and Susan have built and created in this very special home surrounded by pure nature in the Arizona desert. We were wowed by the pictures before arriving but even more wowed after staying there for nearly a week. From the sunrises thru the picture window in the master bedroom to the sunsets from the pool and surrounding patio everyday was truly a masterpiece and enjoyed thoroughly by our family. The attention to detail both inside and out is truly a talent that few of us could duplicate so go and stay for a visit you won't be disappointed. Amazing location for our family Thanksgiving!! Mark & Susan, Thanks for sharing your home with us! We've been renting homes in Tucson for nearly 10 years and yours has been the nicest by far. It's obvious you've put a lot of time and effort into your property as it shows to the smallest detail. Between the big screen TVs, outdoor sound system, and amazing backyard, there's no reason to leave! We also appreciated the welcome goodies - nice not to have to run out as soon as you arrive. The perfect place to relax and rejuvenate and escape from everyday...it's perfect. Hope to return sometime soon! Thank you. - N.B. My family including in-laws and our 4 year old daughter stayed a week in this amazing place! Everything was better much better than the listing eludes to. When we arrived we had a nice bag/tote full of local goodies and a pillow pet for our daughter which blew our mind. The place is truly a home and actually stocked and prepared better than our personal home. I would recommend this to all and can't wait to go back ASAP!!! Thanks again!!! We had a wonderful holiday at Casa Campana!! From the time we walked in the front door we felt as though we had the perfect home to vacation in! We loved the location (far away from neighbors but close to amenities)! This house was ideal for 2 families with kids. The kids played in the pool and hot tub every day! The pool table was loved by the adults! The kitchen was well stocked with dishes and cooking supplies. The scenery was wonderful, especially the sunsets at night around the fire pit. This house feels like home and was very clean and spacious. We would definitely come back for a visit and/or recommend to friends and family. Thanks Mark and Susan!!! Incredible Vacation - Incredible Home! Our family stayed over Spring Break 2014. The home is absoultely beautiful! We've chosen vacation rentals many times in the past, and this was our best experience to date. The home is very large, beautifully decorated, spotless, and has a fully-equipped kitchen. Everyone in the family mentioned how comfy their beds and pillows were! We arrived late in the evening and came in to find a goodie-bag filled with local treats to munch on and water bottles to take on our outings. What a lovely surprise after our long day of travels! The outdoor living area and pool is where we spent the majority of our time. Sitting around the firepit watching the Arizona sunset will be in our memories forever! Tucson is filled with activities and we tried to squeeze in as many as possible - visit to Old Tucson, riding the tram in Sabino Canyon and hiking back down, the ASARCO mine tour, a sunset trail ride at Tanque Verde Dude Ranch, and more! As much fun as we had during the day - we always looked forward to coming "home" and relaxing at Casa Campana! WHEN we go back, we're planning to take a hot air balloon ride, rent bikes to explore the trails, and my husband and I would like to rent a harley for a day. Mark and Susan were wonderful to work with! It was the perfect family vacation! Our favorite rental in 10 years! This is a beautiful home in a wonderful area of Tucson! We have been renting vacation homes for 10 years for our family for Spring Break. Something we've never experienced before was a very nice welcome basket left for us. Complete with local snacks and wine, it was a great touch! I would highly recommend this house! This is not so much a rental property as it is a beautiful home! The owners of this house have really put a lot of thought, time and effort into providing a lovely home that has all of the features one needs to enjoy the Tucson desert. A nice flat screen TV, indoor and outdoor sound system, pool table, table tennis (not Ping-Pong folks), games, movies...one really needs to stay several weeks to use everything. Beautifully decorated, both inside and out - there are so many nice touches, such as solar powered lights on the trees and water fountains, I cannot remember them all. The owners have even thought of the small things, like a generous supply of paper products and a full spice rack for cooking. Nice location as well...hiking in the Totolita mountains nearby is great - try to time it so you can hear the outdoor American indian flute music at the Ritz-Carlton. Our favorite restaurants were the nearby Vero Amore Italian place and El Charro's Mexican (not nearby). The gas fire pit outside was great - I will make that a needed feature on other properties. Did I mention the great gift basket? Mark & Susan more than provided with this home! Everything we needed, or even wanted, was there for us. The home is beautiful and spacious and feels like you are alone in a desert, yet it's still close enough to stores so you can run out when needed - not that you'd want to! We were thouroughly delighted with all the little touches; the front porch at night is magical! Susan was so kind to leave a welcome gift and Mark was so helpful when we had a small issue with the pool. I've rented many homes before and have never felt so taken care of. Thanks for a fabulous time! I really hope to have another stay at Casa Campana. I could go on about the outstanding location, the superb condition of the house, and the amenities - which were many! In short, the house absolutely exceeded all expectations. We would stay again! Couldn't have asked for more! The house is beautiful and impeccably clean. Tranquil outdoor space, and plenty of room through out the house. Owners very attentive and made sure everything went smoothly over the weekend! My family was very impressed with the house and we had a great time! Thanks for the memories! If you want to experience southern Arizona beauty in a peaceful setting, this is the place. The house is lovely and meticulously maintained. There has been a lot of attention paid to details that make the experience comfortable -- lights in the trees, umbrellas and several patio seating areas for all sun locations, modern kitchen equipment, comfortable furnishings, a pool table, remote controlled lights and fans, indoor/outdoor sound system, and the list goes on... The welcome basket consisting of fresh fruit, k-cups, snacks and best-of-all wine was appreciated. It reduced the hecticness of arrival and let us have a break before hitting the (surprisingly) nearby grocery store. There are instructions for everything! It was a relief not to have to spend a lot of time figuring out how to, for example, turn on the TV. It was evident that a great deal of effort had been put into making sure we had a great stay. And we did! Wow, what a beautiful home this is! It was the perfect house for our vacation. The desert scenery was breathtaking, the pool in the back yard was refreshing and the house provided so much room for everyone. The detail and amenities in the house were amazing. The owners anticipated our every need and then some. The house was clean and extremely well maintained. It was perfectly located near the highways, many of the Tucson area attractions, and shopping. We loved our time at Case Campana so much we engaged a realtor while there to assist us in looking for a piece of property for ourselves! We definitely recommend this home and hope to visit again. Thanks for making us feel so welcome. I`m not sure there`s much more to be said than has been in previous reviews! As a ten year vacation home renter in Tucson this is by far the nicest property I and my family have stayed in. The listing and photos are spot on and the owners have obviously put a lot of time and effort into their home as it shows down to the smallest detail. The welcome gift bag and fruit basket were such a treat after having traveled all day from the east coast. If you`re looking for peace and quiet while being close to all that Tucson has to offer this is it....though with the big screen TV, outdoor sound system and amazing backyard retreat you may not want to leave! It`s the perfect place to relax, rejuvenate and escape from the everyday. Thank you Mark and Susan for sharing your lovely home! This was an incredible rental! In fact, I'm not sure how any other rental we may do could ever compare. The property was spotless, even better than the description, and we felt like the owner really cared about our experience. It was the perfect home for several couples or a big family. The kitchen was perfect for cooking away from home, and the outside living area was beyond all expectations. If you're in the Tucson area - this is definitely the place to stay! If we are ever fortunate enough to be in Tucson again, we won't even look for anything else - we know exactly where we'll stay - HERE! We have stayed at a number of VRBO homes in the past. Sometimes pictures make a property out to be better than it is. Not in this case! The home is even nicer than the pictures show. We had a great, relaxing time. The property is very private and first class. Great pool, hot tub and propane fire pit. Beds vare very comfortable. It felt like we were at a 5 star resort which is why we rate it 5 stars. Hope to get there again soon.